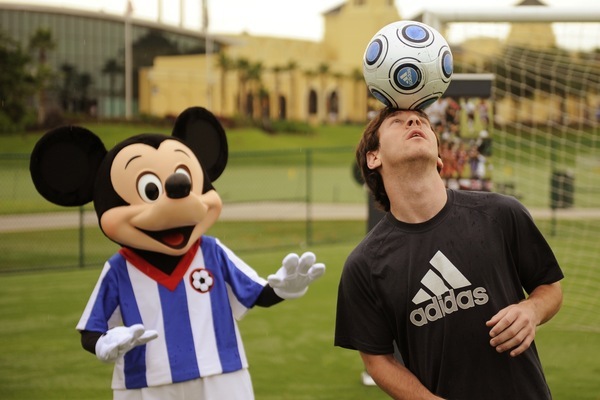 Messi was at the Florida resort yesterday to help promote the ‘Disney Cup Youth International Soccer Tournament’. Mickey was there because, er, that’s his job, to delight/scare small children. I fell in love with his skills since a saw him with under 20’s team. He is without a doubt the best player in the world. The most scary part is that he is in the developing mode still, that’s brutal!!! His demeanor conducting the ball around defenders is incredible, he is so, so soft and really almost no movements in his arms or big fanfarre with his body.